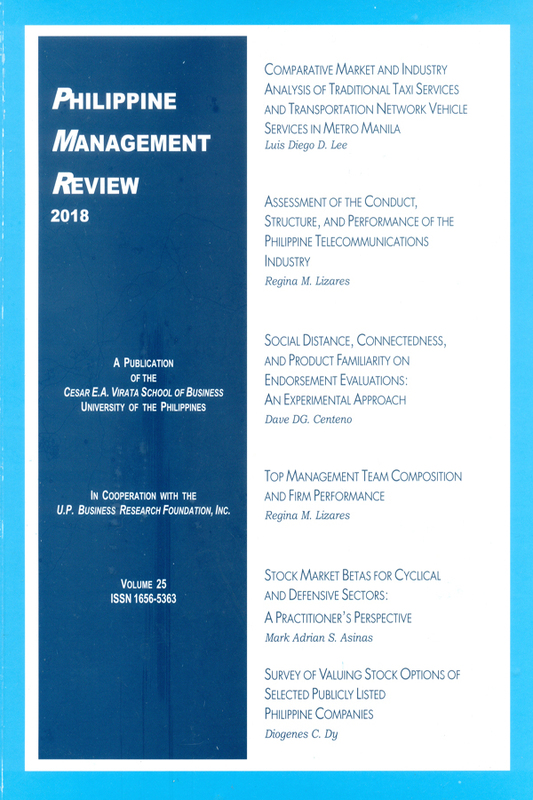 The Philippine Management Review is a peer-reviewed academic journal published annually by the Cesar E.A. Virata School of Business, University of the Philippines with international editorial advisory board and reviewers. It provides a forum for applied research on Philippine finance and management issues. The journal also encourages submission of studies featuring management problems and practices in the Asian region from other academics and practitioners. Accepted articles went through a double-blind refereeing process. Views and recommendations expressed in the articles are the sole responsibility of the respective authors. The journal’s guidelines on publication ethics and malpractice statement are based on Elsevier policies and COPE’s Best Practice Guidelines for Journal Editors. The journal is indexed in ABI Inform of Proquest LLC based in Ann Arbor, Michigan. Manuscripts for publication and editorial matters should be sent to the Editor, PHILIPPINE MANAGEMENT REVIEW, Cesar E.A. Virata School of Business, University of the Philippines, Diliman, 1101 Quezon City, Philippines. Requests for subscription and other correspondence should be forwarded to the UPVSB Dean’s Office, U.P. Cesar E.A. Virata School of Business Bldg., University of the Philippines, Diliman Quezon City by e-mail (cba@up.edu.ph) or fax: (632-929-7991). A list of previous articles is available at http://vsb.upd.edu.ph/ and at http://journals.upd.edu.ph/index.php/pmr.